After the novel and the audio, we arrive at the first film version. 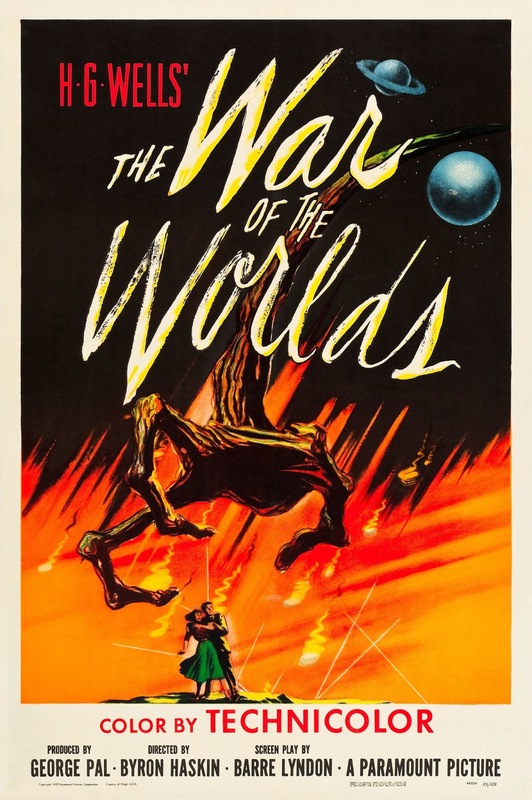 The War of the Worlds (1953) is the first film version loosely based on the classic novel. This version begins by going through the first two World Wars in a documentary style. Then it explains why the martians chose Earth over the other planets. Then people notice a blue fireball descending from the sky. It lands outside Los Angeles. It's too hot to get near, so they leave three men to watch it and head off to a square dance. Soon a the capsule begins unscrewing and an eye stalk emerges and sprays the three men with sparks. The voiceover and 'documentary footage' break in at several time to address the 'world' aspect of the film. This removes the claustrophobic viewpoint of both the novel and audio. It provides its own unique view, but it comes of as rather transparent and flat... just like most of the characters. Then there's our shoved in theme that'll I'll come back to later, let's just start with: "Six days... the same amount of time that it took to create it." Dr. Forrester is our dashing science hero. We get a minimal bio on him that mostly adds up to invincible hero. We have gone far from our everyman here. Though he does slay a martian with a wood plank, so points for that, I guess. Sylvia Van Buren is the love interest. Yep, it is incredibly blatant. She does pretty much nothing else, but scream and cook, despite being a science teacher. There are some natural short cuts such as the martians walking on invisible legs and redesigned martians to accommodate an actor. The martians receive shields which I guess is an upgrade, but the black smoke is gone. Also gone is the reason that the martians came to Earth. Apparently, they just came to destroy everything. Toward the end they are even shown indiscriminately blasting a city. Also, most of the info given, that they arrive in threes and their sweeping patterns isn't used in the plot. This story starts in the long stretches of nothing with sparse towns in California. There is a lot of small talk from every character. The three human outlines in ash were a hilarious touch though. There is a wink and a nod to book when it mentions the martians found a significant base in the British Isles. "We were all praying for a miracle!" Yep, this move credits a literal deus ex machina. I realize that they give the scientific reason, but it is covered in prayer and hymn music. If you like religious films, then this ending is probably great, but I do not. This is an unnecessary addition that defeats the original purpose of the novel's bringing men down to the level of animals and making us appreciate our dominion more. I know they use some similar lines to the novel, but this movie ends on a hymn and a sunrise over a church. Subtle. Also, did Dr. Forrester check that alien's pulse at the end? I think my biggest problem with this film is that, while many nations are mentioned being defeated, the U.S. is never shown as being truly destroyed. At worst, the main characters are briefly stranded and then wind up in a place surrounded by healthy looking people. Even the powered up martians don't feel all that threatening. That combined with the tacked on religious overtones make this a lackluster version. I like to point out this film to prove that I definitely don't love all the older versions of Science Fiction films. 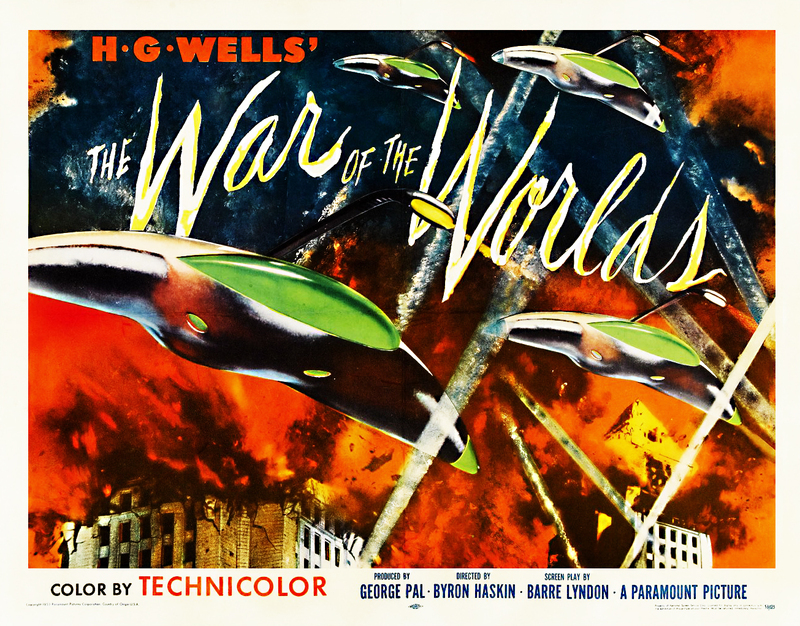 Objectively, however, this film isn't all that bad on its own, it just ends up being an average alien invasion. I'd stick to the novel and audio though. I'll finish up this series with Spielberg's 2005 version tomorrow.